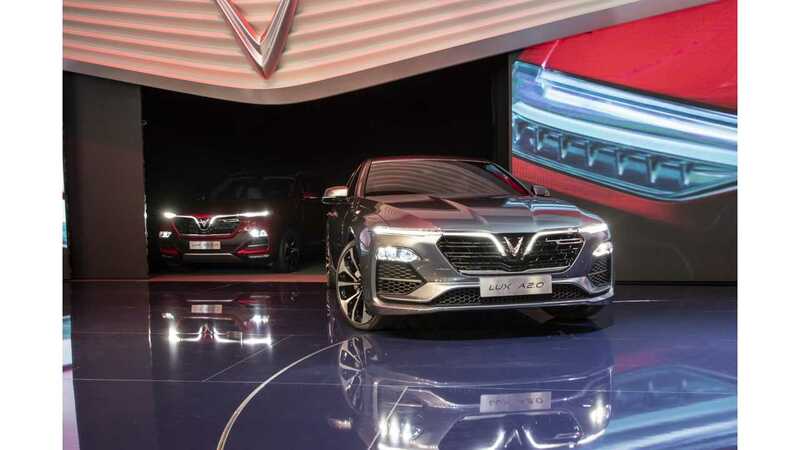 VinFast is a new brand from Vietnam, which unveiled at the 2018 Paris Motor Show its first two conventional cars - the VinFast LUX A2.0 sedan, based on the BMW 5-Series and VinFast LUX SA2.0 SUV, based on the BMW X5. Vehicles were designed by Pininfarina. The company licensed BMW platforms (previous generation) and turbocharged 2.0-liter I-4 engine to begin production in the middle of 2019 at its modern 335-hectare plant complex in Cat Hai, Hai Phong, northern Vietnam. Another model is to be an all-new, global small car, licensed from General Motors. We would not bother to dicsuss those two cars, but according to the press , release VinFast is working hard to bring the first EVs to Vietnam. In 2019 VinFast intends to unveil its all-electric car, which is currently developed by German's EDAG and designed by Italdesign Giugiaro. "Following its investment to bring electric mobility to Vietnam in 2018 with the launch of a range of eScooters, VinFast will unveil an all-new fully electric car in 2019. Design development is being undertaken by renowned Italian design house, Italdesign Giugiaro, while complete engineering development of the car will be led by Germany’s EDAG, one of the world's largest independent engineering service providers. With sales starting in early 2020, it is likely to be the very first electric car on sale in Vietnam." At the same time company is gearing up for electric bus production, beginning from 2019 in cooperation with Siemens. "In August 2018, VinFast signed two agreements to cooperate with Siemens for the development of a fully electric bus (eBus). The agreement specifically relates to electric motor manufacturing licences and the supply of components to support the production of the eBus in Vietnam. Together with the production of e-scooters and electric cars, VinFast’s eBus will not only help improve the environment but also contribute to the transformation of the urban public transport system in Vietnam.The agreements enable VinFast to establish a supply chain for the production of zero emissions public transport vehicles in Vietnam, contributing to the transformation and modernisation of the public transport sector in the country." Together with electric scooters, eScooter, launched in 2018, it seems that company aims for all kinds of EVs.